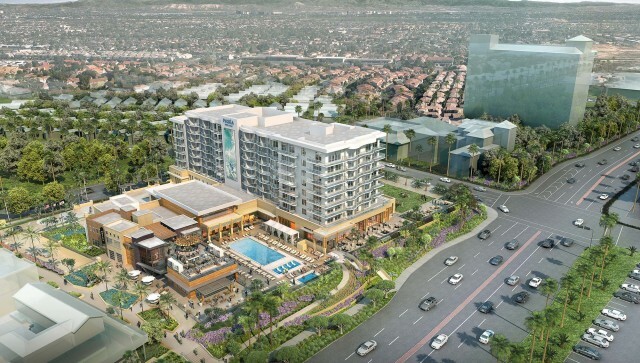 Irvine, CA (June 4, 2014) – From Wi-Fi by the pool to wetsuits in the rooms, a new luxury hotel being built in Huntington Beach is expected to add a splash of style to this laid-back coastal destination. R.D. Olson Development and Pacific Hospitality Group will break ground today on the eight-story, 250-room Paséa Hotel & Spa, situated across from the famous Huntington Beach Pier, a mainstay in the iconic Southern California surf culture. The groundbreaking ceremony includes executives from R.D. Olson Development and Pacific Hospitality Group, special guests close to the project, as well as Huntington Beach Mayor Matthew Harper. The hotel— a combination of beach-chic and elegance — will be integrated with the 191,000- square-foot Pacific City retail and entertainment center, also under development. R.D. Olson Construction is general contractor for the project, which is scheduled for completion in early 2016. Pacific Hospitality Group (PHG) will manage the property as a part of its growing Meritage Collection, which includes independent hotels, resorts, wineries, and golf courses in California’s most desirable travel destinations, including Napa Valley, Newport Beach, Santa Barbara, and La Jolla. In Spanish, paséa means to take a stroll, and combines the words “Pacific” and “sea,” evoking a slow and steady pace. The new hotel will be a modern oasis with an unrivaled sense of clean coastal style, while making guests feel comfortable with sand between their toes. The new Paséa Hotel & Spa will be a short walk from the Huntington Beach Pier, which draws an estimated 16.3 million visitors annually. The property will be designed by renowned international hotel architect WATG, with the guest rooms designed by Monogram by Carlson, interior public spaces by Kay Lang + Associates, and the restaurant and bar by Costa Mesa-based Hatch Design Group. Pool service—food and cocktails from the signature restaurant served poolside or catering to private cabanas. 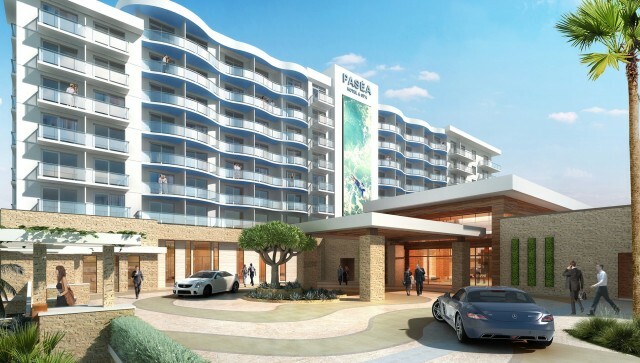 “We see Paséa Hotel & Spa as the quintessential location for group meetings and business conferences in Huntington Beach, as well as for the multi-generational guest seeking an activelifestyle travel experience,” said Tim Busch, CEO of Pacific Hospitality Group. “Paséa Hotel & Spa promises to be an exceptional property in Huntington Beach, appealing to both the leisure and business traveler. With the amount of ocean-view outdoor space, the hotel is certain to be an ideal location for social events and upscale dining and nightlife. We are excited to add another luxury hotel and spa to our growing Meritage Collection,” said Kory Kramer, chief investment officer of Pacific Hospitality Group. Based in Irvine, Calif., R.D. Olson Development is engaged in the development and repositioning of commercial properties nationwide. A specialist in developing hospitality properties, the firm also develops office, retail, multifamily, and recreational projects. Robert Olson founded R.D. Olson Development in 1997 following nearly 20 years as founder and CEO of R.D. Olson Construction. The firm’s portfolio of developments may be viewed at www.rdodevelopment.com. Meritage Collection is a new life and style collection from Pacific Hospitality Group, which includes independent hotels, resorts, wineries, and golf courses. Meritage Collection offers exceptional travel and one-of-a-kind experiences in four of California’s most spectacular locations—La Jolla, Napa Valley, Newport Beach, and Santa Barbara. Blending the best in leisure and group travel, Meritage Collection débuted in 2013 and includes The Meritage Resort and Spa, Bacara Resort & Spa, Balboa Bay Resort, and Estancia La Jolla Hotel & Spa. For more information about Meritage Collection, please visit www.meritagecollection.com.